I am doing NaNoWriMo this year! It's my first time and I am seriously so excited. I am currently working on revisions for ADRENALINE, but if I'm not done by November 1st, I'm gonna burn it. Fact. Since I'm working through my revisions like a crazy obsessed person right now, I haven't had anytime to do much planning for NaNo, which kinda makes me all twitchy and itchy. I'm def a planner. But I have another problem. I have two different ideas and I'm not sure which to do. Idea one is one I've been thinking about for like a year now and I have actually done tons of note taking for this one because it's gonna be harder to write than anything I've ever written. It may be bigger than me, and I may not be able to give it justice, which freaks me just enough not to want to do it for NaNo. Idea two is like my first two books because when I think about it I get antsy fingers to start typing and can tell it will flow fast with less knots to comb out. Really excited about this one! So, I think I know which one I'm leaning towards, but I thought I'd see what you guys thought. The idea I've been dying to work on for months and months or the new idea that will be easier to write? Also, what tips do you have for me since this is my first time? And are you doing NaNo? I'd love to know what your plans are. YA Highway celebrates 3 years! I seriously don't know where I'd be without awesome blogs. I've learned a lot from reading them. I've received agent feedback/critique due to awesome blog contests, and I have more than one awesome book on my shelf won from a blog giveaway. That's why I'm sharing how awesome I think it is that YA Highway is celebrating 3 years! And they have some awesome stuff their giving away to celebrate! Check it out! And I hope everyone is having a great summer! I'm sure most of you know by now that I have an agent. Yes, I have an AGENT!! It's been a couple months now, but it's still exciting! In fact, it's even more exciting now that things have calmed down. Even though it's late I have to share my story. If your wondering how I can be so late to to post something that is such BIG NEWS, I blame it on a crazy month of revisions and having surgery. But I really should have just snuck in here and posted something. So, really, you should actually just blame me. That’s what Ali hears at her first Adrenaline Junkie meeting. On top of that, good grades, too. Say what? Ali and the other recruits don’t think that sounds like much fun. Adrenaline Junkies, properly named The Liberty Ring, is an elite, secret society that meets in a hidden cavern under the locker rooms, and only the strongest are invited to join during their sophomore year. With Ali’s tendencies to stress over straightened refrigerator magnets and alphabetized bathroom creams, it’s no jaw-drop she barely makes it in after punching head cheerleader, snob extraordinaire, in the nose during their last halftime show. Which she so deserved, btw. Ali should be looking for the fastest escape, which just happens to be a human-sized drain in the wall leading toward the Columbia River. She definitely shouldn’t be crazy-head enough to wanna stay. There are three sectors, and Ali wants the highest. When the Assessment period begins, she repeatedly puts herself in danger while pushing her strength, survival skills, and determination to their limits. Not to mention, adrenaline is totally addicting. Almost as much as the Lead, Treston. But she’s a fool because Treston is rude, unforgiving, and most likely wishing she’d never been invited to join. Ali's got until Spring Break to release the grips of her social “Placement” and a parasitic jock so she can prove herself worthy, get her rank up, and grow stronger—mind and body. But Adrenaline Junkies is so much bigger than she first realized, and once you’re in, you’re in. She’s got the brand burned under her collarbone to prove it. I started getting ideas for this story based on the incredible UGLIES series. The characters in those books got to do so many cool things. Things I, myself, would never do. N.E.V.E.R. Yes, it's true. I am so not an adrenaline junkie. But that doesn't mean I can't be one inside my head, late at night make my MC one. As soon as I decided to hunker down and actually start to write my ideas into a first draft I knew I had a winner because the ideas would come faster than I could type it. First draft spilled out in a month. Yes, spilled. It was as messy as orange soda spilled between the cracks of my hardwood floors on a hot summer's day. Of course, the revisions took much longer. I sent some queries right before the holidays, and I was surprised to see I had request after request rolling in. But before they'd started arriving in my happy little inbox I'd started making more revisions (of course) and with the holidays approaching, I decided to continue to work through the holidays and send the requests in afterward. So I did. Right before New Year's could hit, I sent them off, hoping it was good enough. I also sent more queries throughout the long New Year's weekend. One of the first ones I sent off on Friday got an immediate response from an amazing agent asking for an exclusive full. After hearing I couldn't grant exclusivity she still wanted it, and after reading the query and first chapter, she said she knew an editor (at an awesome house) who would LOVE it. I squealed and maybe even jumped up and down, banging the palms of my hands together like an idiot, but I tried not to get my hopes up. So what do you do in that situation? Duh. Send more queries. Just in case, you need more good news when the bad rains down. Double check that. Not a call. THEE CALL. But (of course) my phone was on silent when the call came in and I missed it. Gah! So it wasn't until later that I realized I had missed a call. From a strange area code. Could it be? Frantically checking voicemail. Yes! It is the very same amazing agent saying she wants to talk. I called her back (my mind everywhere) and could barley believe she LOVED my manuscript. And I could barely believe how easy she was to talk to. It was simply awesome. AWESOME! BUT I had to tell her I needed a week to notify other agents with my work. (Way hard to do that, btw) Remember, I had sent a few fulls recently and fresh queries had been going out throughout the weekend. I mean, by the end of the call I was already getting requests from those queries. So I started sending notifications to those with my query or manuscript. I had a lot of interest but being the very beginning of January the timing was kind of crazy. Agents were just getting back to their offices with (I'm sure) very full inboxes. But I did send more manuscripts out. I had interest from another agent and we emailed back and forth a few times but I could tell it wasn't something I wanted to pursue, so we never did speak on the phone. I spoke with offering agent again. Things were going great! Okay, so that probably felt anti-climactic to most of you since you probably already know that. But still. Laura Bradford! Yes, the very Laura Bradford that I hounded with questions whenever she did an #askagent on Twitter. Yes, the very Laura Bradford who was one of the very first agents I actually recognized as more than a name when I started researching. Yes, the very Laura Bradford who was the very first person I thought of to follow on Twitter. I'm sure you all think of her as I do--The Queen Literary Agent of all literary agents, right? Well, not only that but she totally is the Queen Literary Agent that rocks romance the hardest, too!! Per-fect! We worked on revisions, which Laura is awesome to work with, and like I said this is one of the big reasons I wanted to work with her. I knew she'd push me and my adrenaline-crazy characters to be better. It took me about a month and now I'm all twitchy and fidgety waiting patiently while on submission. Oh, and loving every minute!!!! Can We Guess Your Character's Age? So the lovely and fab Brenda Drake is hosting a really fun contest! It's all about guessing your MC's age after reading the first 250! Sounds fun, right? Of course, I had to participate! Check out her blog and contest info here. She's also got Gabriela Lessa as a guest judge, which is awesome and special because one of Gabriela's contests was what got me starting this blog with my very first blog entry. Check out Gabriela's website, too! My knuckles slam into the head cheerleader’s perfect little nose. It feels great. Real great. Well, inside it does. My hand burns like hell. It’s halftime, and the gym reeks of boy—sweat, bad breath, and cheap cologne. Silence drums in my ear so loud it hurts. There are hundreds of faces on the bleachers, and then there’s the basketball team. All staring. At me. Oh, God. The fluorescent lights buzz, telling me to run, but I can’t. Not yet. Instead, I admire how the blood drips from her nostril, over her ivory skin, and soaks circles into her uniform. It looks great next to the matching red stripe crossing her chest. The white stripe matches her pale face. And the blue matches the developing bruise. My fist aches like broken bones, and my heart pounds hard enough to bust ribs. But who cares? I may have ruined Cambelle’s face. Completely worth it. The other cheerleaders freeze—something that doesn’t happen very often. Half of them awed, half angered. Probably fake anger, though. Even her clones have got to hate her, right? “Eeak!” Cambelle shrieks, shaking everyone back to life. Now, there is noise, and it’s even louder than silence. With one last glare, I turn and bolt, my ponytail bouncing like my skirt and automatically making me appear one hundred percent peppy. I shake my tail better than I walk, but all this cheerleader crap really bugs. It’s shamefully lame, but here I am. Thanks again for reading! All comments welcome! Just wanted to drop in and wish everyone a Happy Turkey Day! And also a great Black Friday if you are brave. Me? Well, my hubby wouldn't be very happy if I did, BUT I may try to sneak in a bit of outlining for some revisions I want to make to my current MS. Writers love a lot of things. They love kissing scenes, chocolate, twitter, stalking literary agents on the internet, spending money on newly-released books, contests, the month of November, and adverbs...to name a few. When I joined my fellow writers in the web-o-sphere, one of the first things I learned was that we love our pets, CATS specifically. On the Query Tracker forums you'll find many an avatar with a cat picture. 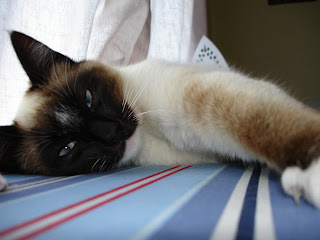 And yes, I too, at one point had a cat picture. 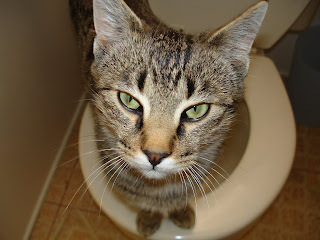 It was my kitty, the late Pepper Paws, using the potty. YES, indeed, he liked to tinkle in the potty, and NO I did not teach him to do that. I've since changed my avatar to my own face. Here is my kitty, Mr. Snuff. I've had him for almost seven years, and he was a great friend of Pepper Paws. He has been a loyal late night writing companion on several occasions. BTW, he doesn't know how to use the potty. Thank goodness. So, in celebration of writers (and anyone else in publishing) and the pets they LOVE so dearly, here's a little video that just cracks me up every time. Now, it's your turn to TELL ME about YOUR PET! I'd love for you to share in the comments section. I write YA novels. My first drafts are perfect. I never eat chocolate. Everyone loves me. I don't forget laundry is in the washer. Agents never reject my query. My house is white glove worthy. I hate staying up too late. And I always, ALWAYS shower before noon. Okay, none of that is true. But that's what I love about my life!